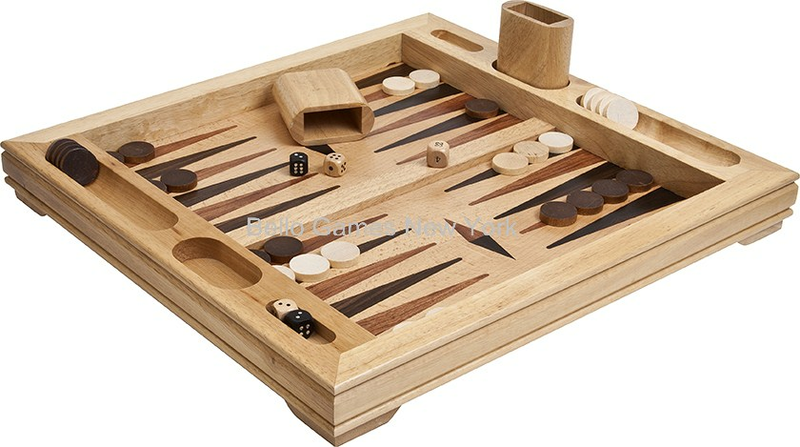 Vesey Street Inlaid Wooden Backgammon Set  - $114.99 : Bello Games New York, INC. This table top backgammon board is made of Oak and other inlaid woods, it is a non folding board. The playing surface and points are made from veneers of dark and light woods surrounded by Oak. The dice cups, backgammon pieces & dice are also wooden. This is a beautiful backgammon to leave on display in your favorite room! Imported from the Orient. • Size: 19" X 17 1/2" X 2". • Checkers: 1 3/16" X 1/4". • Cups: 3" X 3" X 1 1/2". • Dice: 5/8", Doubling Cube: 13/16".